What is the Alliance for Natural Health International? Alliance for Natural Health International is an internationally active non-governmental organisation working towards protecting and promoting natural approaches to healthcare. ANH-Intl campaigns across a wide range of fields, including for freedom of choice and the use of micronutrients and herbal products in healthcare. It also operates campaigns that aim to restrict mass fluoridation of water supplies and the use of genetically modified foods. Through its work particularly in Europe and the USA, the ANH-Intl works to accomplish its mission through its unique application of ‘good science’ and ‘good law’. The organisation was founded in 2002 by Dr Robert Verkerk, an internationally acclaimed expert in sustainability, who has headed the organisation since this time. 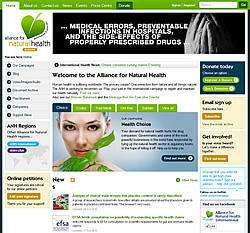 In December 2009 the Alliance for Natural Health joined together with the American Association for Health Freedom (AAHF), of Washington DC, to form the Alliance for Natural Health International (ANH-Intl). Demonstrated clear connections in the disproportionate regulatory management of a wide range of issues ranging from food supplementation, genetically modified (GM) foods, water quality (including fluoridation) and vaccination. Created a united front of common interests across Europe, the North America, Asia and other parts of the world.